After some very bad weather in Auckland in recent weeks, a last opportunity to get out and obseve in this dark of the moon. 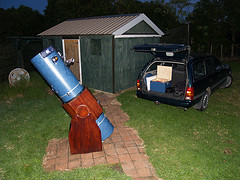 I loaded up the telescope and headed out to Kumeu early. It took ages to get out due to traffic, just over an hour for a 30 minute trip. Chocka motorway. I set up and rested on one of the beds in the observatory until 6:30 PM. Dave Moorhouse turned up along with Alan Kane a bit later. Guy Thornley and Alastair Duhs arrived after 8PM. Equipped with a full prepared Argo Navis, I had plenty to see, but not much time to be out. I had to be home by 10PM. Large oval galaxy with a strong core. 5:2 to 3:1 Oval galaxy. Has a strong core. Bright PN. Round and conspicious. About 1/2 a degree W of a bright cluster NGC2453. Small Open Cluster with about 20 members. Compact with all members less than 11th Mag. A hazy PN looking nebula around a brightish star. Unique, like a PN but is an emission nebula. Not difficult and about 15 arc minutes in size. Small PN. Needs to be reobserved at a higher magnification. Small round planetary. Clearly non stellar and fairly conspiqious. Small PN in Musca. Star chart needed to identify the FOV. Needs more power and more aperture. Small very faint globular. Confirmed FOV and could see an unresolved patch. Very difficult. Bright comet with a strong core. Probably around 10 to 15 arcminutes across. Bright Messier, Virgo A Elliptical. Bright and obvious despite the contrast being low due to high cloud. Bright Messier Galaxy. Bright and obvious despite the contrast being low due to high cloud. This is my first report after logging completly in Astroplanner. I have used AP for nearly a year to upload catalogs to the Argo Navis. I have used Skymap Pro and then imported into AP. I have logged my observations for nearly 9 years, and as of this report, no more objects will be logged in Skymap Pro. I conducted a TPAS and had exceptional numbers, I employed IE and CA in my pointing model. As with the last two observing sessions, I did a full horizon survey of horizon at Kumeu. 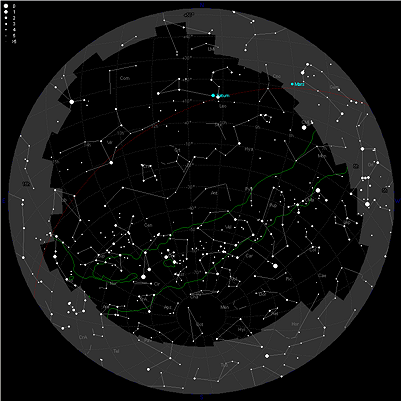 Horizon Map taken from Astroplanner on the right. NGC2467 was a highlight and is was good to catch up with some bright comets. Looked at a good swag of Messier galaxies in Virgo. I observed at higher power on and off. High cloud was present most of the evening but this did not stop the observing for any length of time and some new objects were logged for the first time. Home at 10 PM. Short and sweet.